Death of Monopoly: "Aw, does the poor baby need a... TICHU!" 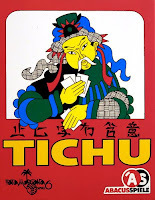 New favourite card game: Tichu. Four players in two partnerships. One simple deck of cards. Plays like many climbing games (see Presidents & Assholes or The Great Dalmuti) but with a few twists. There are point cards as in hearts and four special cards which throw a wrench in everything. As well, the types of sets you can lead come in many varieties. What this makes is a VERY strategic card game with just the right amount of chaos. Think Wizard but a bit heavier. And quite possibly better. We're heading to the cottage this weekend so I imagine many rounds of this will be played. I'll also be bringing Macao and Hansa Teutonica which have been waiting for test drives. Should be fun. Ooh, bring it home with you next time you come! It sounds right up my alley!